The goal with serious or life-threatening situations is to quickly get MMS1 circulating in the blood while trying to stay under the nausea level. One way to achieve this is by using DMSO with MMS1 topically. DMSO is a carrier and therefore takes MMS1 directly into the skin and tissues and thus into the blood. 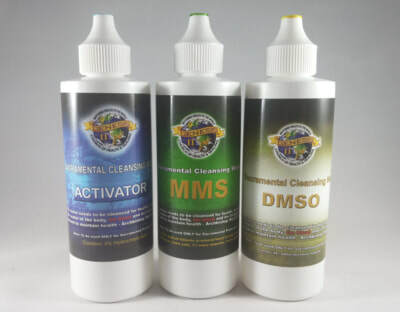 Testing under laboratory conditions by adding tiny non-dangerous amounts of radiation have demonstrated that DMSO carries MMS1 directly to any cancer in the body and it then penetrates the cancer cells. Protocol 3000 is the topical use of MMS1 mixed with DMSO, applied to the body every hour for a minimum of eight hours a day. The MMS1/DMSO procedure described below is an accelerated skin technique that helps push MMS1 into the blood plasma. This method also helps to avoid a Herxheimer reaction. In the case of cancer or other life-threatening disease, it should be used in addition to a normal oral regimen of Protocol 2000. Mix up a solution of 10 drops of MMS with 10 drops of 50% citric acid or 10 drops of 4% HCl acid. Count 30 seconds for activation. Add 20 drops of water. But if this mixture is too strong (causes burning of the skin or other irritation), add more drops of water until it doesn’t cause irritation. If there is no extra skin sensitivity, you may want to add less water (do this in increments), to see if you can tolerate a stronger mixture. Add 1 teaspoon/5 ml of DMSO. Immediately spread the mixture over one arm. You can use your hand to spread the mix. (Be sure your hands are washed and thoroughly rinsed so as to remove all of the soap before applying DMSO.) It is not necessary, and even potentially dangerous to wear a glove, (if latex or rubber). When you have finished, wash your hand with plain water, do not wash with soap and water, as DMSO is a carrier and can carry some of the soap into your tissues. The following hour, mix up another MMS1/DMSO solution and spread it on your other arm. Repeat the next hour and do a different part of your body. Do one arm first, then the other arm, then a leg, then the other leg, then your stomach, and then back to the first arm, and so on. Use a different part of the body each time you apply the DMSO/MMS1 combination. Do this once every hour for eight consecutive hours. Then take a break. Quit from one to four days or however many days it takes to overcome any problems that may be caused by the DMSO (such as extra dry skin). After the first week you can use this topical application four days a week, or more, if there is no problem with your skin. If there is no problem, continue to use MMS1 and DMSO every day, as long as there is no skin irritation. Anytime you experience irritation, cut back for a time, or you can add more water to the mixture. When you quit the MMS1/DMSO topical application for four days you should still continue with your other MMS Protocols. An alternative method is using the same mixture as mentioned above of MMS1 drops to water, but spread this mixture on the body first and then spray DMSO (see pages 261-264 on DMSO spray bottle), or pat on the DMSO over the top of the MMS1 on the same area. Gently rub it into the skin. You can use your clean bare hands to do this. For extra sick people who should take smaller doses of DMSO, it would be best to start out using only a small area of the body. I suggest using an area about the size of the palm of your hand—no larger. Use a small area like this for several days before going to a larger area such as the entire arm or leg. Use a larger area only if there is no adverse reaction to DMSO in the smaller area. Or instead, add extra water to the mixture. That is, instead of using a smaller area to rub the DMSO on, add extra water to the MMS1/DMSO solution and then put it on the entire arm or leg and other areas. When working with DMSO, do not use rubber or latex gloves or other medical gloves. You could get rubber into your body as DMSO melts the rubber. The plastic gloves that are not stretch are one kind of plastic that can be used with DMSO. Keep full strength DMSO out of your eyes. Be careful not to touch your eyes when handling DMSO until you have rinsed the DMSO off of your hands. If you notice a burning sensation on your skin after you have applied DMSO, a good technique is to place a teaspoon of purified water on the burning area and gently rub it in. Keep adding water until it is no longer burning. Or use a spray bottle with plain water in it for such problems, but do rub the water in. ​You can rub olive oil or Aloe vera gel on the skin after the DMSO/MMS1 application in order to soothe the skin if you feel burning or irritation. Note: For a complete list of safety precautions for overall use of DMSO please see pages 25-27. DISCLAIMER: Let it be known that you consent and assume any and all responsibility in the consumption of any product you purchase as a result of your visiting this website or watching these videos. Furthermore, you accept any and all possible damage, loss or injury felt to be experienced as a result from one's exposure to any content, product or information discussed within these videos and the contend on these web pages. Remember, always consult with your medical practitioner or health care professional when dealing with any severe medical condition. All we provide here is INFORMATION. Use it how you wish knowing that you are responsible for your own actions. This information has not been approved nor endorsed by the Food and Drug Administration.